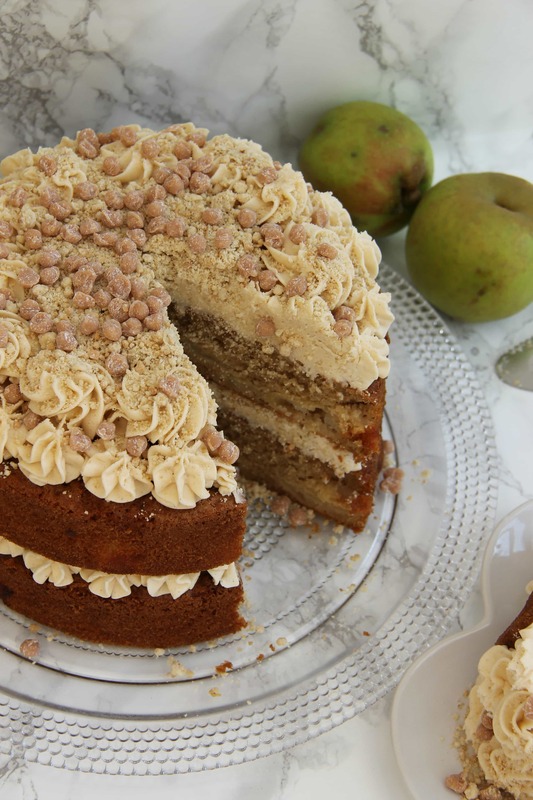 A Light, Delicious, and Really Easy Apple Crumble Cake to satisfy all Crumble & Cake needs. Apple Brown Sugar Crumble Sponge, and Cinnamon Buttercream Frosting! I’ve been wanting to post something like this for a while… It’s well and truly Autumn now, the weather is changing, and its nearly Halloween. I saw a delicious looking post the other day of some Apple Crumble Cupcakes from Zoella, and this inspired me to use the countless amount of Apples that have been growing in my garden recently. I kid you not, I think we have had over 60 apples in just the past couple of weeks, and I can’t keep up with the baking. Some squirrels got to them, and some were eaten away at by bugs, but there were some absolute beauties which I just HAD to bake with. I posted my recipe for a Caramel Apple Crumble Pie last year, and it was well and truly loved (Don’t worry, I will be re-making it as the current photos on the post are well and truly shocking.) and I knew something Crumbly and yummy would be ideal for this post. As Zoe had posted a Crumble Cupcake recipe, I wanted to do a cake to be different. I went for a regular idea with my sponge, using a very similar one to my Salted Caramel Drip Cake using Light Brown Sugar. 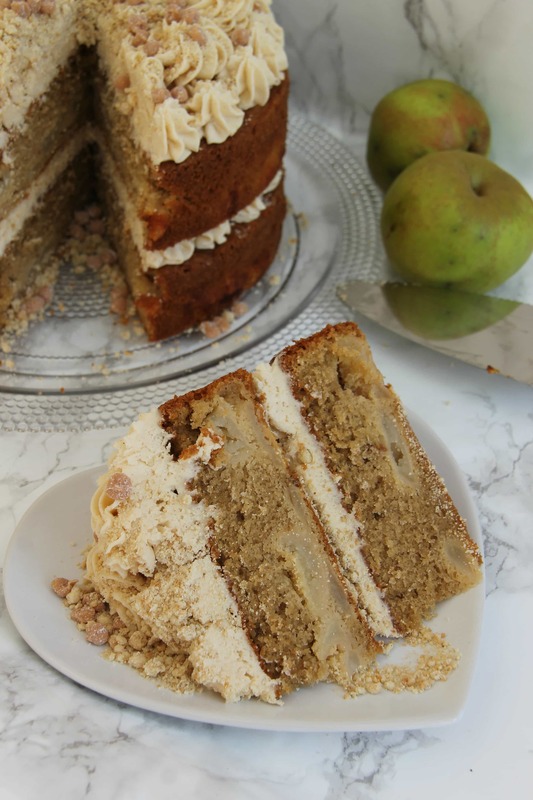 I used a touch of cinnamon in the sponge to give it a bit of an autumnal kick, and it goes SO well with the apples it would be rude not to. I used Cooking Apples obviously (as they’re the ones in my garden) and I wouldn’t use normal apples. (See the tips and ideas section below as to why!). The Crumble topping on top of each of the cakes gives the cake a bit of a crunch, and a different texture which I adore. My Dad said “Its amazing, you go from thinking ‘ooooh lovely cake to ooooh apple crumble’ within each bite! I love it!” And I trust his opinion to the ground. I always make a bit more crumble topping than I need, so I bake off the rest of the crumble topping on its own, and use it to decorate the top with for a bit more crumble goodness. 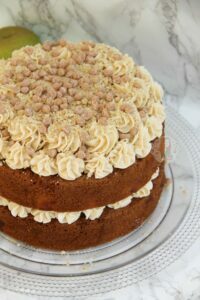 Using a Cinnamon Buttercream Frosting was ideal for this as again, flavour heaven. I made it an easy Buttercream Frosting of 1:2 of Butter:Icing Sugar and it worked wonderfully with the tsp of Cinnamon, and a touch of boiling water for smoothness. I will admit I was a little unsure of how the apples would bake in this cake… Lets just say, I tried part cooking the apples before I put them into the cake, but it didn’t work. 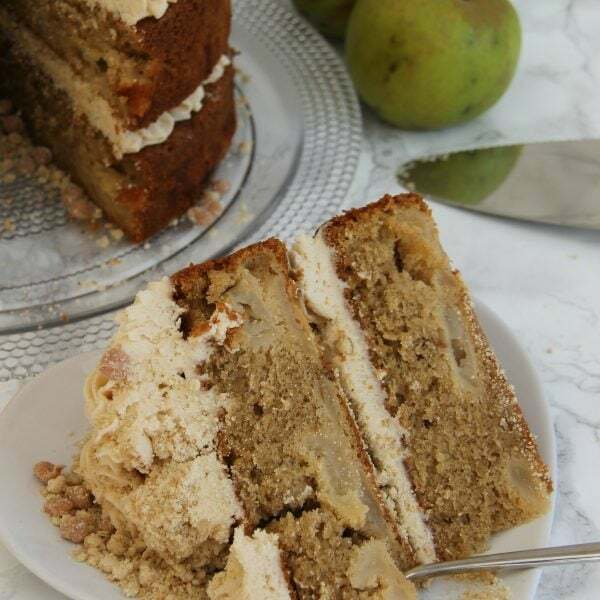 After trying this cake 4 times with this method, it’s safe to say that just coating the apples with sugar for a bit of sweetness, and baking them as they are is best. The amount of time that the cake is in the oven bakes the apples to the perfect texture (as you can see in the picture) and I wish I had just tried it the first time! 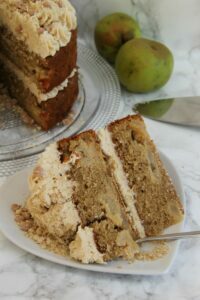 One thing I must say is that in the few times I have made and tried this recipe before posting it, 3/4 times, it took about 45 minutes to bake as the cakes are reasonably deep, and the apples make it take a bit longer, but one time it took about 52 minutes and I haven’t a clue why… maybe to do with moisture, but who knows! I have given tips below on how to know the cake is finished and when! I hope you guys love this recipe as much as I do, enjoy! Put the apples into a bowl, and cover with 50g of Light Brown Sugar. Mix it up so all the apple pieces are covered and leave to the side. Beat together the Butter/Stork and Sugar until light and fluffy. Add in the flour, eggs, and cinnamon and beat till smooth. Fold through the apple mixture and split between two 8” lined tins. After they’re out of the oven, sprinkle any spare crumble mixture onto a baking tray and bake in the oven for 15 minutes or until its lightly coloured (170C Fan). Leave the crumble mixture to cool. Add in the cinnamon and 1-2tbsps of boiling water and beat for about 5 minutes until really light and fluffy. Sprinkle on the crumble mixture and maybe an extra sprinkle of cinnamon, and some sprinkles and yaaaay you’re done! Older Next post: Giant Cookie Pie! Newer Previous post: No-Bake Pumpkin Spice Cheesecake! I buy medium or large sizes from Iced Jems! My favourite is the medium 2D closed star piping tip, or the large round nozzle! 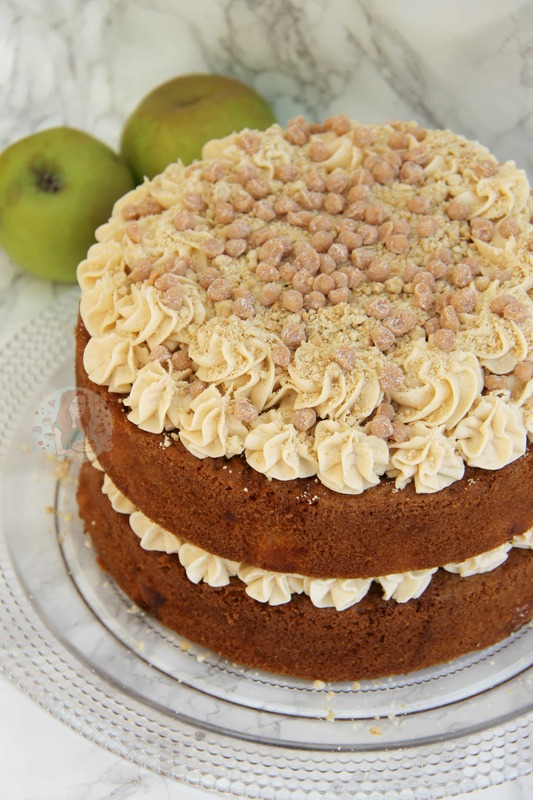 Hi Jane- I love apple crumble and really liked the cupcakes recipe you did! I’m not a massive fan of buttercream so I was wondering, do you think this recipe or the cupcake recipe could work as a traybake and if so what size tin do you think would work best? I have seen your cookie bar recipe but I really like this one. Thank you for your help! I made this today as a traybake in an 8” square tin, I used half the ingredients (quantities slightly adjusted as I only had large eggs), it worked perfectly & is absolutely delicious. I will definitely be making this again. Looks delicious. Would adding some sultanas work ok? Amazing I also chopped up some white chocolate and put on top with the crumble. I made this yesterday with my niece who came over from Canada. Everyone loved it so much it there’s nothing left already and it hasn’t even been 12 hours. Hoping to make this today,is there anything I can use instead of cinnamon? Ooh thank you so much! I am so happy you loved it! Thank you. 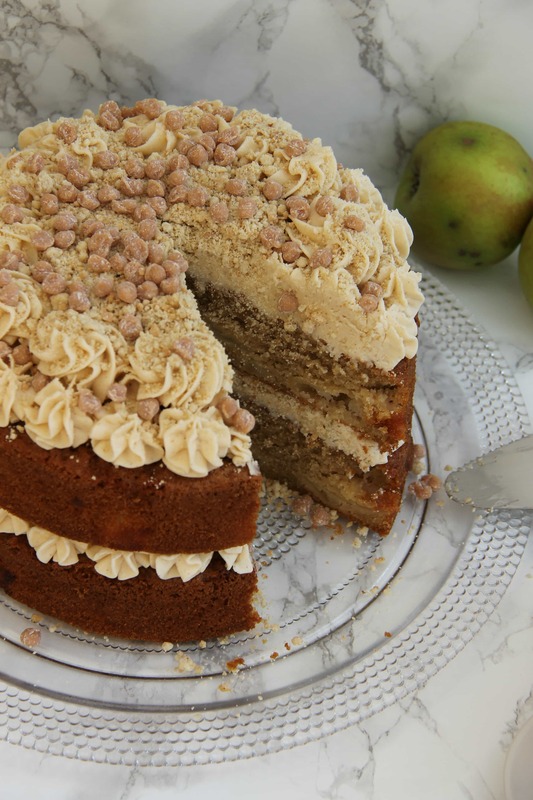 This cake is soooo yummy – I think you did see my post on instagram. Just wondered about something. for the cake i made, i used apples from a friend’s garden and it took about an hour of baking in total. I am totally obsessed with the cake and will make it again. My only issue was the cake was too tall for my liking. Is it possible to use 2 x 12 inches round tins instead? and perhaps adjusting the baking time? I would not recommend two 12″ tins at all, the volume difference is far too large it wouldn’t work very well at all. I’d say two 9″ tins would work best if you want it slightly thinner.. or 10″ at a push, but you risk the apples not cooking properly if you reduce the size and baking time. Baked this for my husband who adores all things apple. It is easy – and truly delicious, but it struggled to hold its delicate shape when getting it out of the tin. Any suggestions for making it a little more resilient? Fabulous cake! Can’t wait to try it. Please can you tell me what sprinkles you used, they look like caramel?